Hello everyone! Cadaver here from Home of Cadaver, giving you an update on what’s happening on my painting table right now! Quite a while ago I had a small talk with a friend of mine about how great Mordheim really is. He and his local club had just started a small campaign and I thought that it would be really nice to jump into action and remember the good old days. My all time favorite Witch Hunter warband would be glad to burn some witches once more but I thought that a new one would be much better. 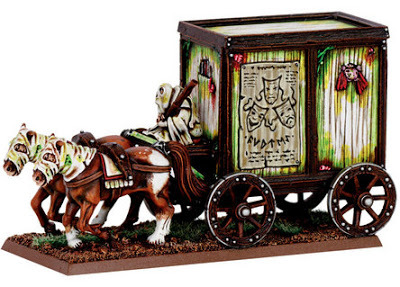 In our talk we also discussed about the ridiculus prices Mordheim models and warbands are sold on ebay and the discussion ended on the Plague Cart of the Carnival of Chaos. This model goes for prices of up to 150 Pounds on ebay and I really didn’t want to spend all these money on such a (not so great after all) model. Therefore, the idea really came into my mind, I should make one of my own. Not so long ago, I have purchased my own 3D printer and since then I had a ton of fun creating all sorts of things, so I have decided to use it for this project as well. I have found a nice file over the internet for a carnival cart and I decided to use this as a base model. After quite a few hours of printing the end result is the following. The end model have been extensively converted and modeled to create that slimey and rotted look that papa Nurgle always favors. The driver is based on a plastic Skaven model with lots of sculpting to create the robes. Tiny bits and pieces were added to the cart, trying to avoid going overboard. I wanted to keep that one simple yet full of character. The paint scheme is mostly based on the original model. I liked the contrast of the boney white areas with the dark brown ones. I really like the colors on here. It looks Nurgley without being pure green, which is great. Glad you like it mate! 3D printing is the best thing in our hobby! The possibilities are endless. I tried to make it look Nurgley without having the usual colors. One of these days I’ll get a printer. I like your approach to Nurgle. When people just paint green all over something and call it Nurgle, it’s just uninspiring. This looks much better. me too, I can’t stand green blobs with a bit of a wash on top. To create a disguisting effect is much more than that and I try my best to achieve that with every Nurgle model I make. Really cool, one of my favourite war and from Mordheim too! Would love to see the rest of the warband sometime! Way cool. The colors look fantastic, a great mix of nasty green/brown and yet realistic enough that it could actually be a gothic cart. We are getting a 3D printer for the office and look forward to trying a few things like this on it. 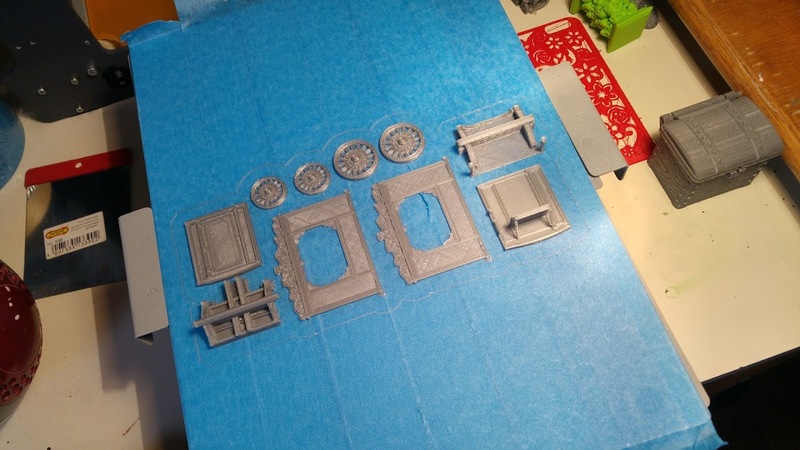 It’s a while yet before it could do full minis, but will be great for building up parts like your main cart structure. Thank you! I love how it turned out too. Glad you like it! There are tons of ready things out there to be printed, just a google search will convince you. Your imagination is the limit! Well played, you ended up saving a lot of money and creating something more original and all. Thank you! its true I couldn’t stand the original model anyway, let alone the insane prices it goes off ebay! Really great piece. I would have never thought it was 3D printed. It looks fantastic and the paintjob is great! Thank you mate! Glad you like it! Very cool and great Nurgle colours. This is pretty cool, have you shared the Stl. file anywhere , i would love to print one of my own. Hello! Sorry for the delay in the reply, I just saw the message! Thank you @Thor_CT:disqus for letting me know!